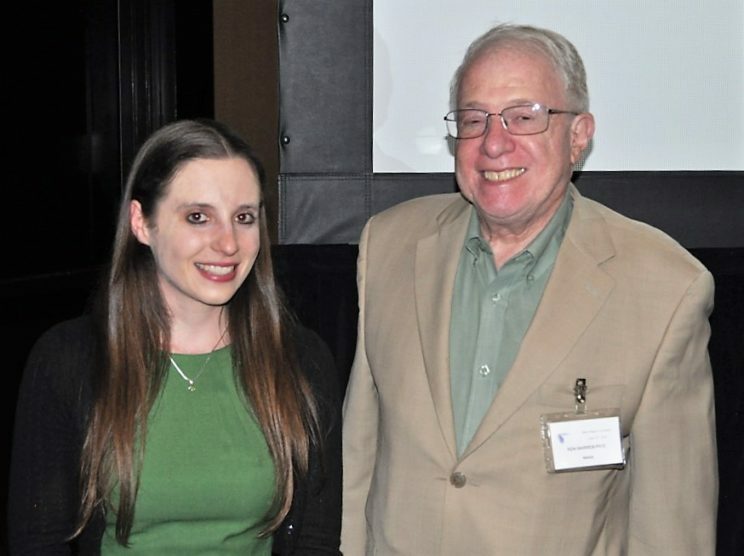 Tamara Bodnar, a current PhD candidate in the Weinberg Lab, recently received the Kenneth Warren Merit Award presented by the Fetal Alcohol Spectrum Disorders Study Group (FASDSG) for outstanding research in the field of Fetal Alcohol Spectrum Disorder research. This award is presented each year at the annual FASDSG meeting – this year held in New Orleans, LA – and includes a travel stipend to support the awardee in attending the meeting to share his or her research. Tamara’s presentation Effects of prenatal alcohol exposure on immune function across the lifespan reviewed the exciting research she has completed as part of her doctoral dissertation work at UBC. Tamara is pictured above with former Acting Director and Deputy Director of the National Institute on Alcohol Abuse and Alcoholism (NIAAA), Dr. Kenneth Warren, for whom the award is named.